Blogs come in a variety of topics and formats. They invite in-depth looks at a multitude of topics, as well as glimpses into the lives and interests of people from around the world. In the case of the Wade authors, there are a number of scholars, enthusiasts, and organizations dedicated to the study of their lives and works that offer some helpful resources delivered via blogs; including the Wade Center (as is evident to you, our readers). In this post, we will take a look at some of the blogs where the Wade authors are studied and appreciated. This is by no means a comprehensive list! We hope it will serve as a useful starting point to whet your appetite for continued exploration and as a means to learning more about the seven authors of the Wade Center and related subject areas. The following details were gathered from the blogs directly, so if you manage one of the blogs below and have additional or updated descriptions, please contact us. Have other suggestions for intriguing Wade related blogs? Post them in the comments below! *Note that we are not including podcasts or general websites in these lists; rather, we are defining a blog as a regular series of textual, date-stamped posts. These blogs discuss multiple Wade authors and/or related topics. Diana Pavlac Glyer blog: A blog of intermittent posts from Lewis, Tolkien, and Inklings scholar Diana Glyer. She is Professor of English at Azusa Pacific University. “I Have An Inkling” blog by Mark Sommer: Posts about news, books, and other topics relating to the Inklings, which included 4 of the 7 Wade authors (Barfield, Lewis, Tolkien, Williams). “Islands of Joy”: A blog focused on the theme of “Sehnsucht” (meaning joy or longing), which C.S. Lewis wrote about; this deep sense of desire is most often evoked by art, poetry, literature, music, or nature. Several writers contribute to this blog. “Kalimac’s Corner” by David Bratman: Personal blog of Bratman, a scholar who specializes in Lewis, Tolkien, and the Inklings. “Letters from the Edge of Elfland” by David Russell Mosley: David has a PhD in theology from Nottingham University and writes posts (“letters”) about theology, creativity, and their places in everyday life. His posts can include content on Lewis, Tolkien, and Chesterton. “Transpositions”: A blog on theology, imagination, and the arts managed by The Institute for Theology, Imagination and the Arts (ITIA) at the University of St. Andrew’s, Scotland. Several writers contribute to this blog. C.S. Lewis Foundation: Interviews with C.S. Lewis scholars, information about the Foundation, and words of encouragement. The C.S. Lewis Foundation is based in Redlands, CA. C.S. Lewis Society of Chattanooga, Tennessee: Contains news on the Society, and Lewis-related topics and information. Moderated by Rev. David Beckmann. George MacDonald Society Blog: Posts include Society news and events notices, book announcements, and MacDonald related topics. Moderated by Mike Partridge. The George MacDonald Society is based in the United Kingdom. Tolkien Society: Publishes Society news and a wide variety of Tolkien related topics. This blog has multiple authors. The Tolkien Society is based in the United Kingdom. “Works of George MacDonald” by Michael Phillips: A website that maintains several “blog” resources under its “Regular Features” and other tab sections, including MacDonald Q&A, information on MacDonald rare book editions, daily devotionals, prayers, blessings, and poems, etc. Phillips is the author of George MacDonald, Scotland’s Beloved Storyteller (Bethany House, 1987), and has adapted MacDonald’s works for contemporary readers. “The Oddest Inkling” by Sørina Higgins: A blog dedicated to exploring the life, works, and ideas of Charles Williams. The earlier posts on the blog are particularly helpful for an overview of Williams’s ideas and biography. Higgins is in the process of posting overviews of works by Charles Williams in publication order. She serves as Chair of the Literature & Language Department at Signum University’s Mythgard Institute, and is currently a doctoral student at Baylor University. “Along the Beam” by Rebekah Valerius: Posts on Lewis and integrated approaches to Christian apologetics. Valerius is a graduate student studying apologetics at Houston Baptist University. Crystal Hurd blog – Hurd is an educator and Lewis scholar from Virginia. She is currently researching the parents of C.S. Lewis, Albert and Flora Lewis, and her posts focus on books, Lewis, and related topics. “Dangerous Idea” by Victor Reppert: The personal blog of Reppert contains posts on C.S. Lewis in the areas of reason, science, and philosophy, as well as other topics of interest. Reppert also manages a blog titled “Dangerous Idea 2” and a blog study guide of Lewis’s Mere Christianity. Reppert is the author of C.S. Lewis’s Dangerous Idea: In Defense of the Argument from Reason (InterVarsity Press, 2003). David Beckmann blog: Personal blog of Rev. David Beckmann and dedicated to helping others learn more about the life and works of C.S. Lewis, with an emphasis on spiritual topics. Beckmann is the founder and moderator of the C.S. Lewis Society of Chattanooga, TN. “Essential C.S. Lewis” by William O’Flaherty: Provides daily quotes by C.S. Lewis, and includes links to other Lewis-related resources (podcasts and scholar interviews). “The Lamppost: C.S. Lewis, Narnia, and Mere Christianity” by Will Vaus: Provides information on Vaus’s books, travels, and a variety of Lewis-related topics particularly in the area of theology. Vaus is a pastor, public speaker, and the author of several books about C.S. Lewis and his works. Mark Neal blog: Personal blog with topics relating to C.S. Lewis, particularly on the function and life of the imagination. Neal is co-author of the book The Surprising Imagination of C.S. Lewis with Dr. Jerry Root (Abingdon Press, 2015). “Mere C.S. Lewis” by Ken Symes: Covers topics relating to Lewis and politics, apologetics, ethics, and evangelism. “A Pilgrim in Narnia” by Brenton Dickieson: A blog project in reading and talking about the work of C.S. Lewis and the worlds he touched, including children’s literature, apologetics, myths and mythology, fantasy, theology, cultural critique, and writing, as well as the work of his fellow Inklings J.R.R. Tolkien and Charles Williams. Dickieson is a university lecturer, and freelance writer from Prince Edward Island, Canada. Dimitra Fimi blog: Personal blog of Fimi, who is Senior Lecturer in English at Cardiff Metropolitan University and co-editor of the book A Secret Vice: Tolkien on Invented Languages (HarperCollins, 2016). “The Flame Imperishable” by Jonathan McIntosh: A theology blog on Tolkien, St. Thomas Aquinas, and related topics. McIntosh is a Fellow of Humanities at New Saint Andrews College, Moscow, Idaho, and teaches courses on the Great Books, medieval thought, Tolkien, and other areas. John Garth blog: Personal blog on a variety of Tolkien topics, particularly World War I. Garth is a freelance writer, researcher and reader, and a widely-acclaimed Tolkien and World War I scholar. He is the author of Tolkien and the Great War (Houghton Mifflin, 2003). “Lingwë – Musings of a Fish” by Jason Fisher: Tolkien scholar Jason Fisher provides the following list describing his blog topics: “J.R.R. Tolkien, C.S. Lewis, the Inklings, J.K. Rowling, and fantasy literature in general; language, linguistics, and philology; comparative mythology and folklore.” He is the editor of Tolkien and the Study of His Sources: Critical Essays (McFarland, 2011). LOTR Project by Emil Johansson: Blog relating to the creative and ambitious web project dedicated to the works of J.R.R. Tolkien, including an extensive Middle-earth genealogy, a historical timeline of Middle-earth, and statistics of the population of Middle-earth. Johansson is a Chemical Engineering student currently living in Gothenburg, Sweden. “Parma-kenta” by Troels Forchhammer: This blog is maintained by a Danish Tolkien scholar, and contains lists to many Tolkien resources & headlines, as well as posts of varied Tolkien-related topics. A key feature is “Tolkien Transactions” – a review of online Tolkien content that Forchhammer has deemed interesting enough to share with his blog readers. 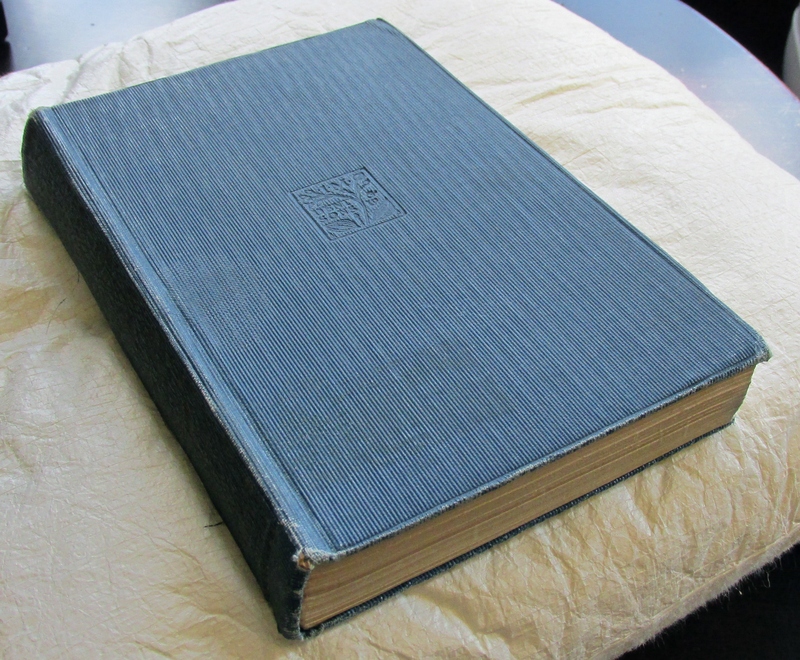 “Sacnoth’s Scriptorium” by John D. Rateliff: Personal blog of Rateliff, who is an independent Tolkien scholar and author of The History of the Hobbit (Houghton Mifflin, 2007). “Tolkien and Fantasy” by Douglas A. Anderson: The blog defining itself as “musings on Tolkien and modern fantasy literature.” Anderson is the editor of the books The Annotated Hobbit (Houghton Mifflin, 2002), Tales Before Tolkien (Del Rey / Ballantine Books, 2003), and Tales Before Narnia (Del Rey / Ballantine Books, 2008). “The Tolkienist” by Marcel R. Aubron-Bülles: Contains a wide variety of Tolkien-related topics by Aubron-Bülles, who is a German freelance journalist and translator. “Too Many Books and Never Enough” by Wayne Hammond and Christina Scull: Personal blog of Tolkien scholars Hammond and Scull on a variety of topics relating to Tolkien studies. Hammond and Scull are known for their in-depth reference books on Tolkien’s life and works, Tolkien bibliography, books on Tolkien’s artwork, and their work editing Tolkien’s books. Christina is the former librarian of Sir John Soane’s Museum in London, England. Wayne is Chapin Librarian in the special collections department of the Williams College Libraries in Williamstown, Massachusetts. “Wormtalk and Slugspeak” by Michael Drout: A personal blog featuring various Tolkien topics, Anglo-Saxon and medieval studies, and the study of language patterns in literature. Drout is Professor of English and Director of the Center for the Study of the Medieval at Wheaton College, Norton, MA where he teaches Old & Middle English, medieval literature, fantasy, science fiction and writing. He is the editor of Tolkien’s Beowulf: The Monsters and the Critics and the Tolkien Studies journal. George MacDonald, ca. 1860s-1870s. Wade Center Photo Collection: GM / P-1. George MacDonald’s life led him on extensive travels. In 1872-1873 he offered a successful lecture tour in the United States. He also traveled throughout Great Britain as well as various countries in Europe. However, apart from Scotland and England, the country where he spent the most time was Italy, which became a second home for his family in MacDonald’s later years. How did a Scottish Victorian author come to have such a close connection to Italy? That is what this blog post will explore. The MacDonald family experienced numerous health issues over the years. 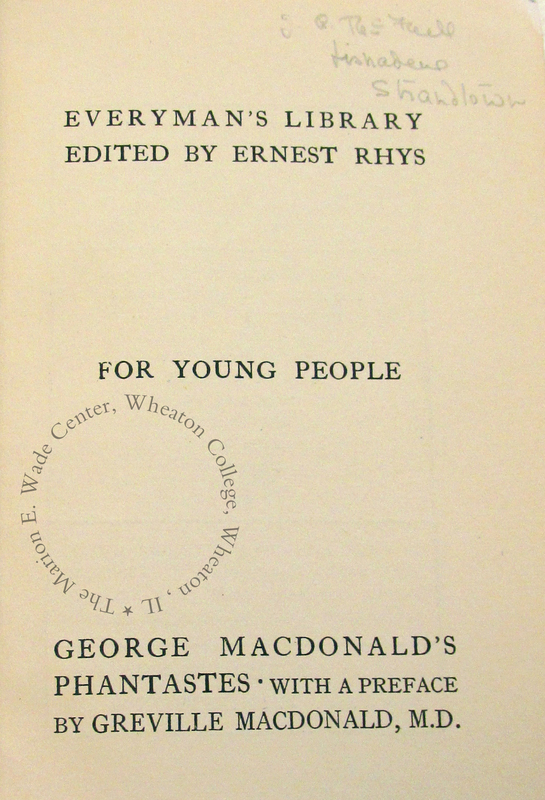 George MacDonald himself was in “delicate” health and suffered frequent illness from a young age, particularly with pleurisy. He also battled asthma, lung infections and bleeding, and bouts of debilitating exhaustion as a result of his extensive efforts to write, travel, and speak. Such strenuous work and activities were necessary to support his large family of eleven children. By the 1850s, it was evident that he was suffering from tuberculosis. Out of concern for his health, Lady Byron (wife of Lord Byron and a friend of MacDonald’s), arranged to send George, his wife Louisa, and their daughter Mary to Algiers, where he would be able to recuperate in a more moderate climate. In September 1856 the three traveled to northern Africa where they remained until May 1857, while the other MacDonald children stayed at home in the care of relatives. The rest cure was beneficial, and MacDonald returned home to Huntly, Scotland strengthened and healthier. The warmer climate and diverse culture in Algiers had not only been rejuvenating, but had also fascinated him. Algiers came to mind when, in 1877, MacDonald’s daughter Mary developed an advanced case of consumption. Usually a lively and engaged girl, Mary had become withdrawn and listless during her illness, which caused her family great concern. MacDonald was also suffering from an episode of poor health at the same time, and so the decision was made to take Mary to southern Europe or Africa in hopes that the climate could improve her health much as it had done for her father back in 1857. The decision to choose Italy was largely due to a family friend who was accompanying the MacDonalds abroad. The friend, Hatty Russell, spoke Italian and her mother lived in Nervi, Italy, so in spite of the political turmoil present in Italy at that time, it became the chosen destination. The MacDonald Family, 1876. L to R, 1st row: Maurice, Winifred, Bernard; 2nd row: Ronald, Robert Falconer, Irene, George MacDonald, MacKay, Mary; 3rd row (standing): Grace, Greville, Louisa, Lilia, Ted Hughes (Mary’s fiance). Wade Center Photo Collection: GM / P-9. Louisa, Mary, and three of the other MacDonald children — Lily, Irene, and Ronald — departed for Italy on September 25, 1877 along with Hatty Russell and a maid for Mary. George MacDonald remained in England with his other children, working hard to write his novel Paul Faber, Surgeon. The Italian group of MacDonalds settled in Nervi and rented a home named Palazzo Cattaneo where George and the other children joined them in November. “Out the window lay a large, beautifully terraced garden filled with orange trees. And down the slope to the west shimmered the waters of the Ligurian Sea, placid and clear, dotted with little sailing vessels. . . . MacDonald’s delight in his new surroundings rapidly grew. He now had greater solitude, cleaner air, and more beautiful sunsets than in England” (George MacDonald: Victorian Mythmaker. Nashville, TN: Star Song Publishing Group, 1993: 301-302). The mild Italian climate enabled George to feel significantly better with little to no discomfort from his asthma or other lung ailments. Sadly, despite what seemed to be a promising recovery in her strength early in the trip, Mary’s health continued to steadily decline. She died on April 27, 1878, the first of several losses the MacDonald family would suffer in the years to come. Realizing that remaining in Italy was a more affordable option for the family, they decided to stay another year. After their lease was up in Nervi, they relocated to Portofino and the house Villa Barratta. The new location was isolated and beautiful. There was no carriage road leading to the house, but the MacDonalds had a boat to row across the bay. They began to invest time in learning to speak Italian, and MacDonald was able to write steadily due to the solitude as well as his improved health. His novel Sir Gibbie, a favorite for many readers, was written during this time in Italy and completed by the end of 1878. While living in Portofino, the MacDonald family also entertained guests in their home and performed dramas of stories like The Pilgrim’s Progress. These acting endeavors were a great delight to the family and continued over the years as a way to provide hospitality as well as an extra source of income. Some may wonder how the MacDonalds could afford to travel abroad when their finances were generally tight. The income generated by George’s speaking engagements and publications was supplemented, as mentioned above, by the family’s dramatic performances. In addition, a portion of their expenses was covered by the generosity of family friends. A kind and loving man, George MacDonald had a large circle of friends who were quite wealthy and were often moved to help the MacDonald family with practical needs for health, housing, and daily life. The MacDonalds in turn were always ready to welcome others into their home, providing warm hospitality and a haven to all who visited them. These visitors included many friends and relatives from Great Britain who were visiting Italy, as well as the needy among their neighbors such as orphaned children and the poor. In addition to these sources of income, Queen Victoria honored George MacDonald with an annual Civil List Pension in the amount of 100 pounds sterling beginning in 1877. Bordighera, Italy ca. 1880s. Wade Center Photo Collection: GM-L / P-18. Bordighera, Italy in 2009. Photographer Association Culturelle Bordighera. Wade Center Location File, Series 8.4 folder 1. Before returning to England in mid-May 1879, the MacDonalds decided to officially make Italy their second home. They resolved to winter there regularly in the years to come and to settle in Bordighera (the images above show views from ca. 1880s and 2009), putting an offer on a house and intending to finalize the purchase upon their return in February 1880. When they arrived back in Italy, however, they were dismayed to find that the house owner was no longer willing to sell; though he did allow the MacDonalds to stay in the home while they made other living arrangements. Michael Phillips writes that Casa Coraggio “quickly became the center of life for a rapidly growing colony of intellectual Scots and English in the area.” (George MacDonald: Scotland’s Beloved Storyteller. Minneapolis, MN: Bethany House Publishers, 1987: 319) Casa Coraggio not only gave the MacDonald family a wonderful home, but it also gave them adequate space for plays, lectures, musical performances, and the ability to host a steady stream of friends and relatives as well. Casa Coraggio ca. 1900. Wade Center Photo Collection: GM-L / P-6. The MacDonald family scrubbing the floor of Casa Coraggio, date unknown. Wade Center Photo Collection: GM-F / P-8. The British came to Italy not just because of the scenery, but also, like the MacDonalds, for health reasons and the hope of escaping or being cured of tuberculosis. Once there, they created a number of charitable and philanthropic endeavors in the area, sharing in the welfare-minded movements of the Victorian era of which MacDonald was also a part. Casa Coraggio as an apartment building, 2009. Photographer Association Culturelle Bordighera. Wade Center Location File, Series 8.4 folder 1. Plaque on the building acknowledging its history as MacDonald’s home. Photographer Association Culturelle Bordighera. Wade Center Location File, Series 8.4 folder 1. As mentioned earlier, the MacDonalds suffered additional deaths in the family during the years they lived in Italy. After Mary’s death in 1878, their fifteen-year-old son Maurice developed a cough and fever, and died two weeks later on March 5, 1879. They would also lose daughters Grace (d. May 5, 1884) and Lily (d. November 22, 1891), and their little granddaughter Octavia at just nine years old (d. 1891). MacDonald himself (d. September 18, 1905) was cremated in Britain but buried in Bordighera, next to his wife Louisa (d. January 13, 1902), and daughters Grace and Lily. It is perhaps fitting that despite his Scottish heritage and love of Britain, MacDonald’s final resting place should be in this enchanting place that he also greatly loved. Indeed, Bordighera not only nurtured George MacDonald with its beauty, but its temperate climate also helped to restore his health, thereby enabling him to have time and strength to write a number of his best-loved works — ones that would be enjoyed for generations to come. MacDonald’s grave, 2009. Photographer Association Culturelle Bordighera. Wade Center Location File, Series 8.4 folder 1. The cemetery in Bordighera where MacDonald is buried. Photographer Association Culturelle Bordighera. Wade Center Location File, Series 8.4 folder 1. We are pleased to announce the release of VII Volume 32, the Wade Center’s annual journal. Beginning with this issue, the title of our publication has changed from Seven: An Anglo-American Literary Review to VII: Journal of the Marion E. Wade Center. (See the end of this post for more on the name change.) This volume of VII highlights influences on the Wade authors, particularly the importance of family, friendship, and career background. Crystal Hurd provides new insight and background information on C.S. Lewis’s relationship with his father, Albert Lewis. William Howard takes a closer look at the supportive friendship between George MacDonald and Lady Byron, the wife of poet Lord Byron. And Christine Fletcher examines Dorothy L. Sayers’s career in the advertising industry. The relationship Albert Lewis had with his sons Warren (Warnie) and Clive (Jack) was complex, as is a common occurrence between parents and children. 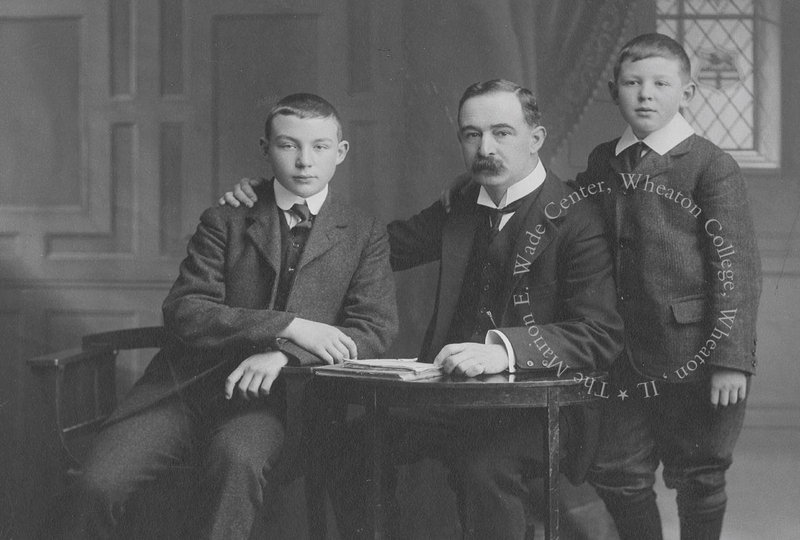 Albert’s good intentions as a father were sometimes misunderstood and often poked fun at by his two sons. In her profile on Albert Lewis, Crystal Hurd analyzes Albert’s motivations and the mid-Victorian tendencies that influenced his parenting. She explores several misunderstandings that caused Jack to have little affection for his father, including Albert’s choice of boarding school for Jack, his lack of visits during Jack’s wartime leave during WWI, and other father-son issues. Warren, Albert, and C.S. Lewis, ca. 1908. In William Howard’s piece, he examines the origins of George MacDonald’s friendship with Lady Byron. His article relates MacDonald’s reaction to an account of the disintegration of the Byrons’ marriage presented to the press upon her death in 1860. Howard illuminates the touching nature of MacDonald’s friendship to Byron during a trying time. Howard also provides context into how Lady Byron’s other friends, including Harriet Beecher Stowe, reacted to the ending of the Byrons’ marriage. Volume 32 also includes other articles on Lewis, Williams, and the Inklings. Remembrances in the issue honor Dr. Barbara Reynolds, a founding editor of VII; David Gresham, C.S. Lewis’s stepson; David Neuhouser, founder of the Center for the Study of C.S. Lewis and Friends at Taylor University; and Bruce L. Edwards, a foremost Lewis scholar and a mentor to many. VII also celebrates the 50th anniversary of the Wade Center with the poem specially written by poet Luci Shaw to commemorate this milestone in the life of the Wade. Several photos from the celebration on October 29 accompany the poem. The longtime VII reader will also note the updated subtitle of the journal. As scholarship on the seven Wade authors has grown and deepened over the past half century, there has been increased interest in the works of these authors worldwide. When Dr. Clyde S. Kilby, Dr. Barbara Reynolds, and Dr. Beatrice Batson founded VII in 1980, the majority of work being done on these authors was coming from Great Britain and the United States. The desire at that time was to strengthen ties between these groups of scholars, hence the name VII: An Anglo-American Literary Review. 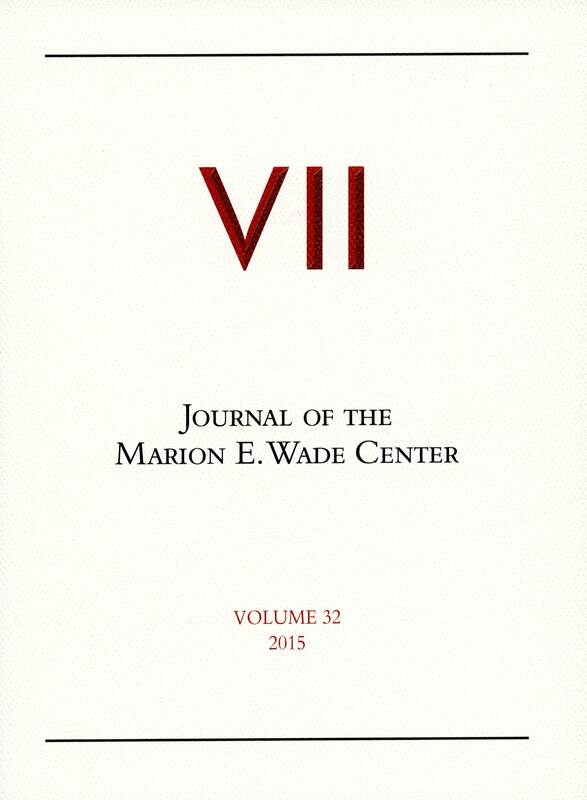 However, now with an increasingly international readership in mind, the subtitle no longer applies; thus, as of this volume of VII, the name was changed to VII: Journal of the Marion E. Wade Center in order to more adequately reflect the truly global readership and scholarship on these seven authors. Please visit the VII website for more information about this volume and back issues. Note that beginning with Volume 31, VII is now available for purchase online. Kilby, Clyde S., and Marjorie Lamp Mead. Brothers and Friends: The Diaries of Major Warren Hamilton Lewis. New York: Ballantine, 1988. Jennifer Woodruff Tait, managing editor of Christian History and Wade author enthusiast, graciously offers “Off the Shelf” readers some of her reflections on the “Seven Literary Sages” issue and its significance in her own life. Our thanks also go to Jennifer for the editorial expertise and creative work she contributed to make this issue such a success. On November 22, 2013, C.S. Lewis was formally “installed” into Poets’ Corner at Westminster Abbey, gaining a memorial stone there along with such luminaries of British literature as Chaucer, Shakespeare, Byron, Dickens, Austen, the Brontë sisters, T.S. Eliot, and W.H. Auden. The service was dignified; the organ thundered; the choir sang. I was there. My husband, kids, and I spent the days before the service joining fellow Lewis enthusiasts at a meeting of the Oxford C.S. Lewis Society, a tour of the Kilns (Lewis’s home, now a museum), and a symposium on Lewis’s works and worth. On the way home, we visited Dublin, Ireland and attended the Sunday morning worship service at Trinity College. There I met a woman who became interested in our trip to the Lewis memorial. She obviously knew of Lewis’s status as a British author and had seen the movie Shadowlands. But she was puzzled by my being there on behalf of a Christian magazine. “Was Lewis particularly religious?” she asked. And I wondered: Though Christians have valued his work for decades, how much did Lewis and his friends and mentors change the society around them? What legacy did they leave to the modern secular world? That question was part of the reason I was in Oxford and London. I was covering the memorial celebration for issue 113 of Christian History magazine, which was dedicated to the seven authors whom the Wade Center collects. 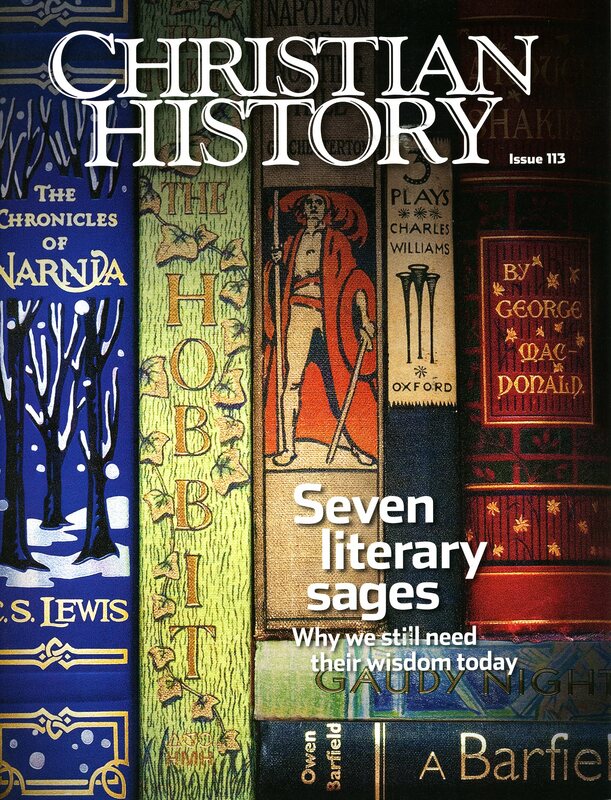 Released in conjunction with the 50th anniversary of the Wade Center, we called the magazine “Seven Literary Sages: Why We Still Need Their Wisdom Today.” It told the story of how those “Seven Sages” took on secularists, materialists, and modernizers with their weapon of choice: the pen. With the assistance of the Wade we assembled a lineup of knowledgeable scholars: Suzanne Bray, Matthew Dickerson, Crystal and David Downing, Colin Duriez, Brian Horne, Kirstin Jeffrey Johnson, Alister McGrath, Michael Ward, Ralph Wood, and Edwin Woodruff Tait. They explained to our readers in fresh and entertaining ways how the Seven Sages expressed a vision for society in areas ranging from economics to education to the environment; a vision for Christian literature in their powerfully moving treatments of goodness and self-sacrifice; and a vision for discipleship in their pictures of love in community. They also emphasized how millions read their books and by those books were inspired, by the help of God’s grace, to create art, practice goodness, and seek the truth. (I am one of them: from Prince Caspian to Lord of the Rings to Gaudy Night to The Greater Trumps to Orthodoxy, the logical arguments and poetic visions of the Seven Sages have enriched my Christian discipleship for decades.) And we were able to illustrate the entire issue with a range of gorgeous photographs, many from the Wade’s own collection. The magazine has turned out to be one of our runaway best-sellers since Christian History returned to publication by Christian History Institute in 2010. It’s by far our most popular issue judging by the number of online readers as well as requests for print copies. I’m personally thrilled to have been part of introducing so many new readers to authors who, in many cases, I have known and loved since childhood. But, not wanting to neglect others who have known and loved these authors for years as well, I commend the issue to you. Read, marvel, and enjoy! 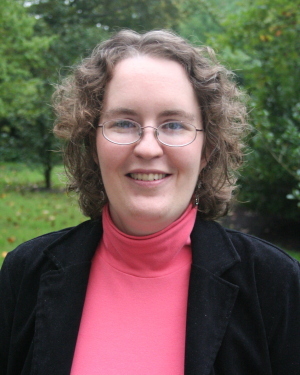 Jennifer Woodruff Tait (Ph.D., Duke University) is managing editor of Christian History magazine, managing editor of the Patheos Faith and Work Channel, a candidate for ordination to the priesthood in the Episcopal Church, and author of The Poisoned Chalice and Histories of Us. From 2004-2013 she was the recording secretary for the New York C.S. Lewis Society. She lives in Richmond, KY on an 8-acre farm with her husband (who proposed to her on the bridge in London where G.K. Chesterton proposed to Frances), her two daughters (both of whom love Narnia and Middle-earth), and her in-laws. The Wade Center owns over 2,400 volumes from the personal library of C.S. Lewis. Most of the books were acquired from Wroxton College in 1986, and others have been added from time to time from other donors or purchases. The books offer a unique look into the reading habits, imagination, and mind of Lewis himself, and many of them contain his handwritten notes and markings. Such annotations are a big research draw for Lewis scholars who are able to discern significant aspects of Lewis’s response to his reading; a valuable step beyond simply knowing which titles were on his shelf. Besides the markings, however, are the books themselves as physical artifacts. Observing the different bindings, seeing which ones are worn or barely touched, adds to the stories the volumes tell. In some cases Lewis mentions specific books in his writings, and it is always a thrill for Wade patrons to then hold that same referenced book in their hands. 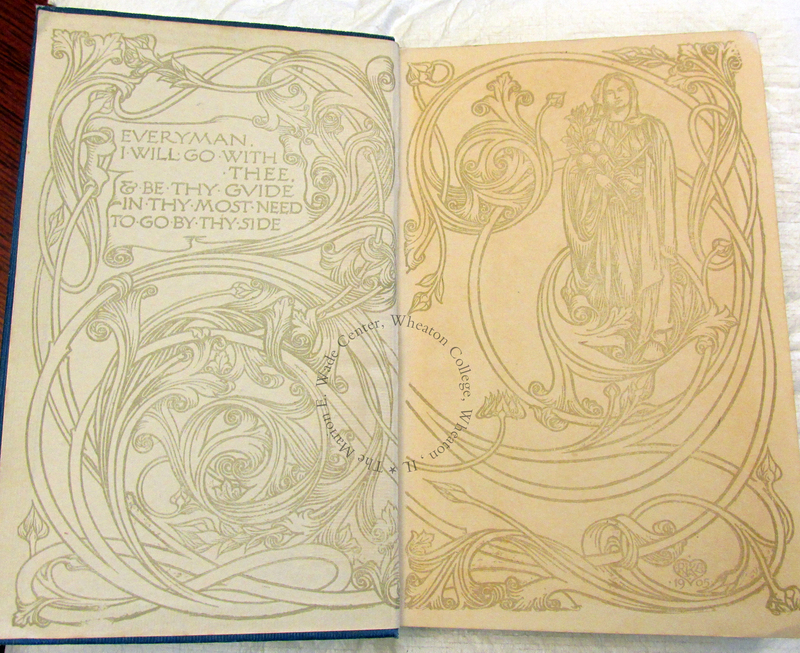 Spine of Phantastes by George MacDonald. “It is an experience of intense, even painful, but desired, longing, which, after [Lewis’s] conversion, he came to believe was a desire for unity with the divine (though intermediate objects are mistaken for the ultimate object). … [Joy] is imaginative in that it is often set in motion by literature or music, which are the products of the imagination; it involves being transported beyond the physical and emotional to a rapturous state that could take place only in the imagination at an inspired level.” (p. 8) — Schakel, Peter J. Imagination And The Arts In C. S. Lewis: Journeying To Narnia And Other Worlds. Columbia: University Of Missouri Press, 2002. Although Lewis’s conversion to Christianity would not come until many years later, he cites this episode as a major step along the way, and his future reading of MacDonald’s works continued to delight and inspire him. The following photos are from the interior of the Phantastes volume described above. Visitors to the Wade Center are welcome to request this, and the other volumes from Lewis’s library, for on-site viewing and personal study. The endpapers of Phantastes. The Everyman edition series aimed to produce beautiful printings of classic books at modest and affordable prices. 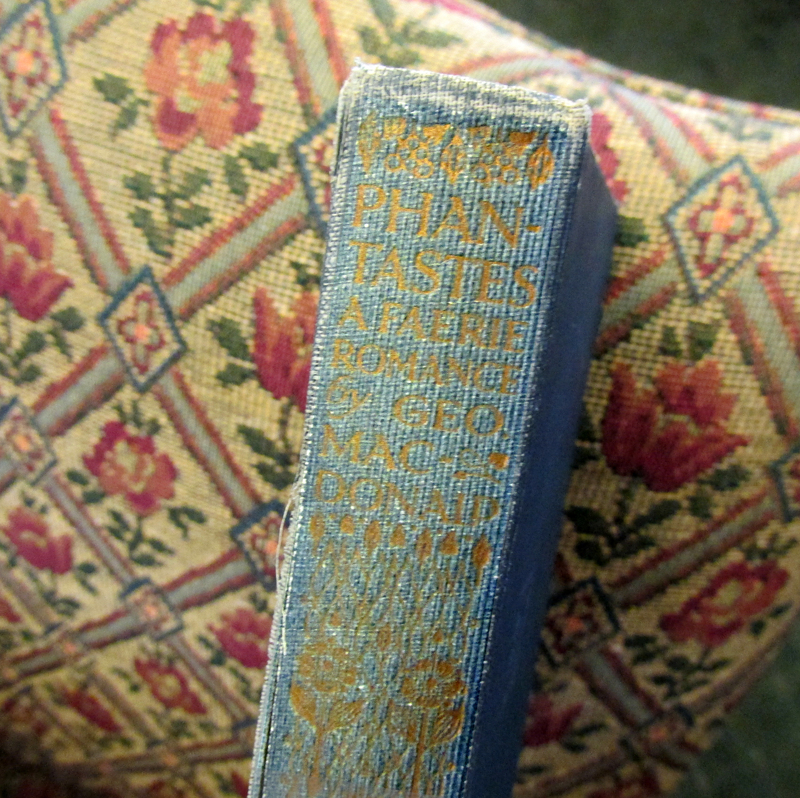 The half-title page of Phantastes. An ownership signature in the upper right corner suggests the book was owned by someone before Lewis. The book itself carries no other notes or annotations, but it is worn and obviously has been read numerous times. In this post, Russian Fulbright scholar Olga Lukmanova shares about her recent work at the Wade Center over the past six months, how her involvement with the Wade began, and her future projects as she heads back to Russia. Olga is the first Fulbright Scholar at Wheaton College, and her main research focus is writing the first Russian language biography of George MacDonald. 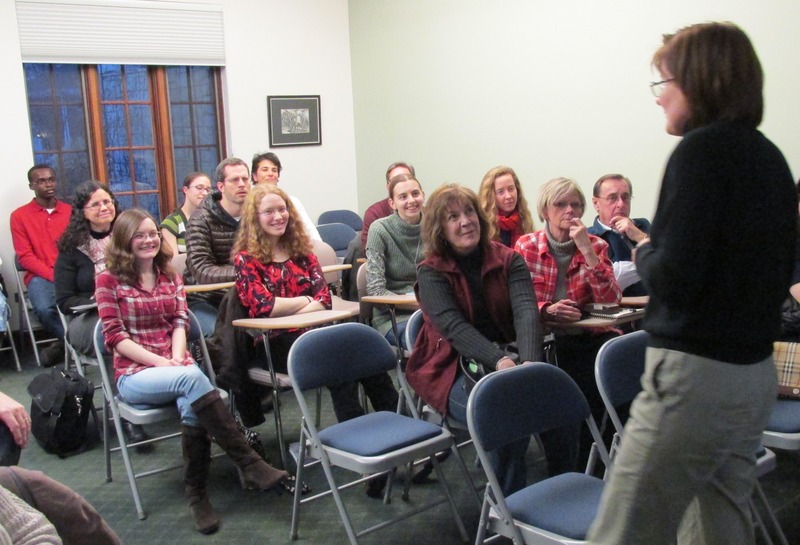 She was in Wheaton from September 2014 to February 2015, presented lectures on George MacDonald and J.R.R. Tolkien, in addition to other speaking engagements on campus during her time here. 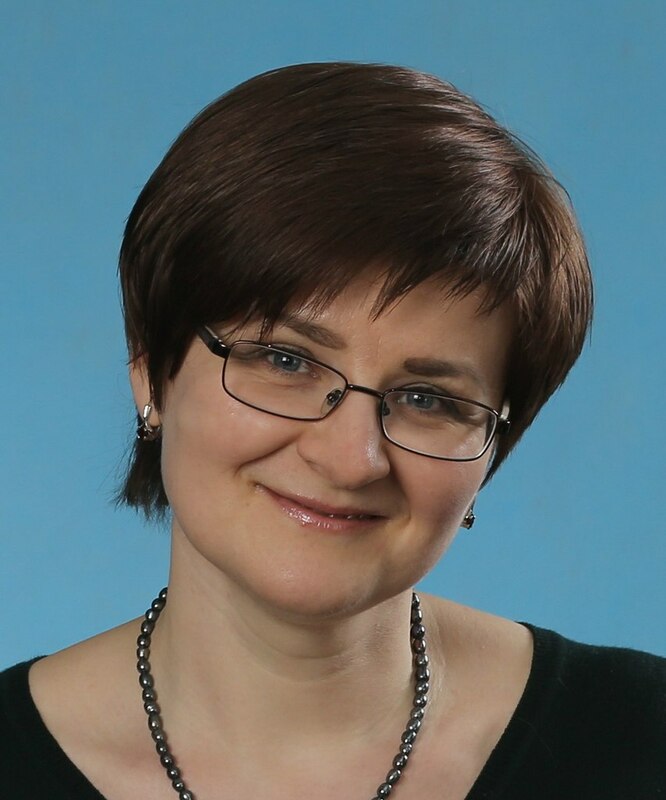 We are very grateful to Olga for sharing her time and talents with us, and wish her the best on her continued work and research. My first proper introduction to the Marion E. Wade Center and its collection took place four years ago, in 2010 – although I actually remember hearing about the C.S. Lewis collection and seeing the famous wardrobe while it was still in Buswell Library, when I briefly visited Wheaton in 1993. In 2010 I was in the middle of working on my Ph.D. dissertation on George MacDonald’s fairy tales, and a good friend recommended me for participation in Wheaton’s European Summer Study Program, telling me about the Wade Center and its George MacDonald resources. The six weeks in Wheaton and at the Wade during the summer of 2010 became a haven of uninterrupted reading and writing as well as a chance to meet and get to know some very knowledgeable people, including Dr. Rolland Hein, Marjorie Mead, and Laura Schmidt, who pointed me to the right resources and provided much guidance and advice both during the summer and in the years since. My dissertation was successfully defended in 2012, but my work on George MacDonald continued, and my publisher and I soon realized that, along with writing scholarly articles and translating his books, it would be helpful to produce a biography of MacDonald biography for his readers in Russia – especially given his remarkable life and the importance of understanding his theology and its practical outworking for a deeper appreciation of his books. So when I had a chance to apply for a Fulbright grant for visiting scholars, I proposed writing a Russian biography of MacDonald, and Wheaton College and the Wade Center graciously agreed to host me as a Fulbright scholar. The first question the Fulbright selecting committee asked me during the interview was, “Why do you need to go to America to study a Scot?” My explanation must have been sufficiently convincing, because I was given a grant to spend six months in Wheaton, researching and writing the book. Well, my six months are almost up: I am returning to Russia on March 1st and back to my university classroom on March 3rd. I am bringing home 360 raw-ish pages of the biography, two large boxes of books (and dozens more on my e-reader), numerous scans of letters, articles, and individual book pages that were simply too many and too rich to process during my stay here, and new ideas as to what and how it should be put into the book as I continue going through biographical materials, family letters, and MacDonald’s texts. During my time in Wheaton I also managed to complete the book and lyrics for the musical ‘The Light Princess,’ based on MacDonald’s fairy tale, so I am looking forward to rehearsals and its final production in July 2015. In addition, I am planning to develop and launch a comprehensive Russian-language website on MacDonald’s life and work, which will feature excerpts from the biography, scholarly and popular articles, family letters and photos, Russian translations of his books (and links to where one can buy them) and many other materials. 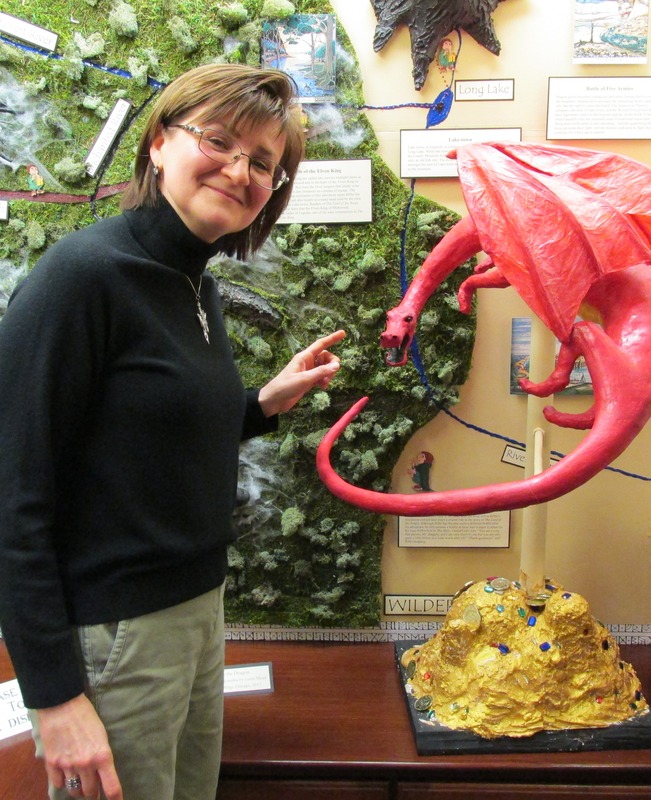 Olga with Smaug the dragon in the Wade Center’s museum. I am deeply grateful to the Wade Center staff for their warm welcome, assistance and friendship as well as the chance to share some of what I have been working on with others through the lectures I was able to give here. It was great fun doing research on the history and reception of Tolkien’s books in Russia and sharing my findings and conclusions with the Tolkien Society. All in all, this time at the Wade has been another reminder of just how life-giving and relevant, how brilliant and funny, how deep and compelling these seven authors are and how much they have to teach us (I remember the quiet thrill of looking at C.S. Lewis’ pencil marks in his personal copy of MacDonald’s sermons and feeling quite ridiculously proud of them both). It has also been good to be away from an intense teaching workload and to have the quiet and unhurried time and space to read, think, write, and meet with new and old friends, discussing everything under the sun, from church liturgy to Russian films, to MacDonald’s attitude to animals and theater. I am leaving feeling refreshed, comforted – and most of all, challenged to have faith and trust even when “in the feebleness of foiled effort, it wants yet more faith to rise and partake of the food that shall bring back more effort, more travail, more weariness” (George MacDonald). Olga Lukmanova giving her lecture titled: “Tolkien to Russia: There and Back Again” at the Wade Center, January 29, 2015. The MacDonald book-plate, which includes the family motto: “Corage! God mend al!” (an anagram of ‘George MacDonald’). 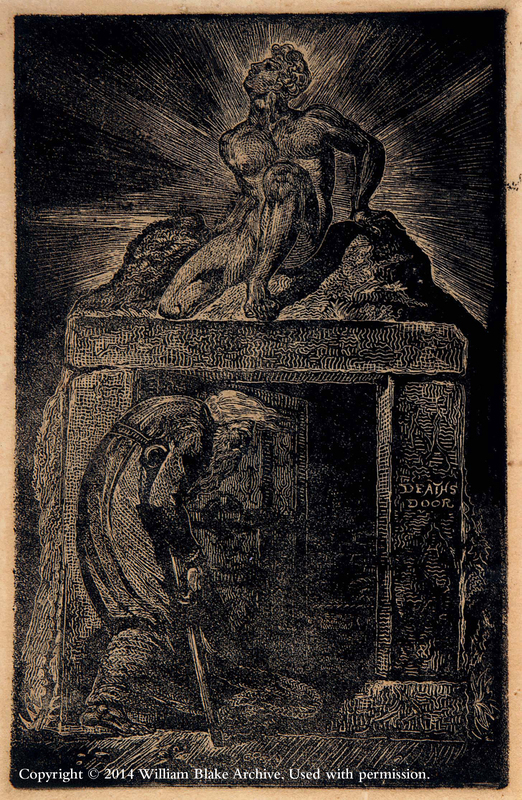 The etching “Death’s Door” by William Blake, designed to accompany the poem “The Grave” by Robert Blair. Collection of Robert N. Essick. Copyright © 2014 William Blake Archive. Used with permission. Blake’s etching is titled “Death’s Door,” shown here, by kind permission of the Blake Archive. Several other variations of this etching exist as well. Redemption and rebirth were common themes in MacDonald’s writings, and serve as a fitting identifying image to be placed in books which no doubt helped their owner experience those very subjects. 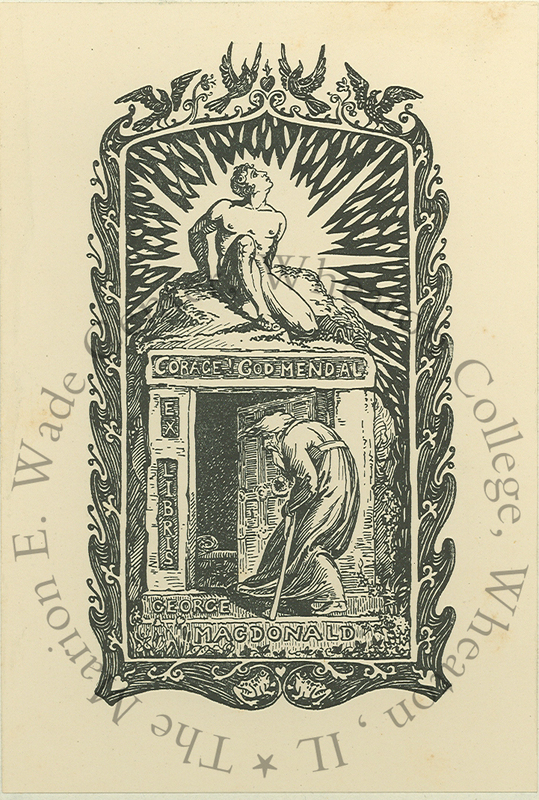 A book containing MacDonald’s bookplate is currently on display in the Wade Center’s Museum. Drop by to see it in person! Boice, Daniel. 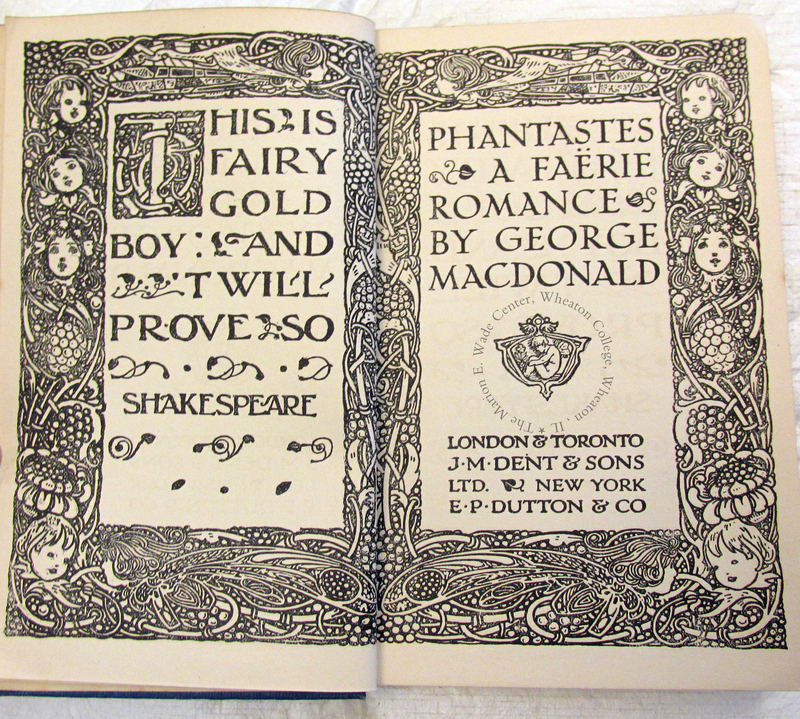 “A kind of Sacrament: Books and Libraries in the Fiction of George MacDonald. ” Studies in Scottish Literature. Vol. 27: Issue 1. 1992: 72-79.